Now that we have the house hunting behind us, my next project is to pick out a color scheme for our new home. I'm leaning towards corals and light blues with a backdrop of pale grey walls and dark stained floors for the downstairs mudroom, entrance, living and dining area. The problem is that you've got your pinky corals and your orange corals. As soon as I decide on a nice bright orange coral in a bold graphic print, I see a lovely soft pinky coral that looks better. And it's really hard to tell what you're getting when you order online. I had good luck with a pale blue fabric, but got a little off course with something I thought was coral, but turned out to be a little more deeper and darker red-orange than I wanted. Up above is a combination I was playing around with. I checked out the fabric in person, so I know that the striped coral is closer to orange than pink. The stripe fabric is P/Kaufmann indoor/outdoor in Mayberry/Cinnamon from Hancock's of Paducah (that's fun to say). 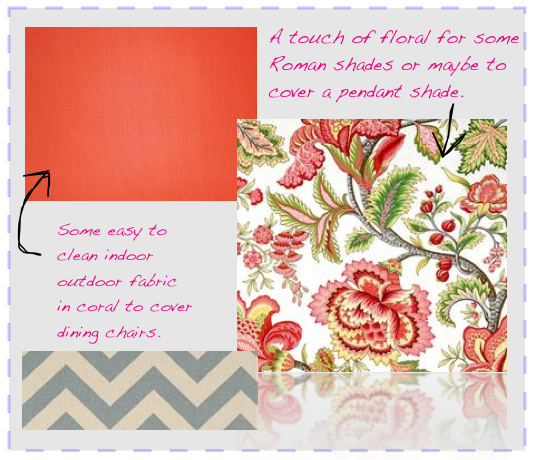 The floral is Robert Allen Summerlin Geranium from Online Fabric Store. A zig zag is so fun and modern. Gotta get it in there somehow. Maybe a little pillow or two with that. I'm no where near close to a final decision here, but at least I'm taking notes so I don't forget some of these combinations I'm coming up with.